Barbara Lidfors was born in Iowa and grew up in Minnesota, USA. Her early interest and love for art was influenced by her father, Eugene Johnson, who was a painter, a potter and an art professor at Bethel College in St. Paul, Minnesota. His interest in combining artistic pursuits with his Christian faith later resulted in the creation of the nation-wide American arts organization CIVA (Christians involved in the Visual Arts). When Barbara was 12 years old her father took his family on a 4-month camping tour of Europe, visiting and photographing significant works of art in 10 countries. What she saw and absorbed during this art-packed European trip significantly influenced her later artistic development. After studying two years at Westmont College in California, Barbara Lidfors returned to Bethel College to earn a B.A. degree in 1971. Further art studies, with an emphasis in painting, followed at the University of Minnesota. In 1982 she moved with her husband, Robert, and children to Germany. 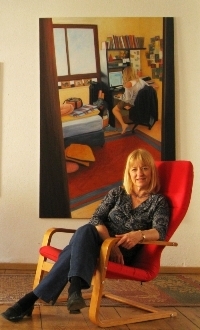 Barbara focuses her artistic interests on painting the people and places that are part of her everyday life. As her personal experience expanded to include people of other cultures, this also was reflected in her work - particularly in paintings of African and Indian village scenes. The completion of an M.F.A. degree in 2001 from Vermont College of Norwich University in Vermont, USA, further focused her interest in painting people and narrative scenes. Her paintings introduce us to specific individuals whose gestures and physical bearings reveal their unique cultural and experiential backgrounds. We observe people in the anonymity of public spaces as well as in the intimacy of private spaces. They each have a story. The favored technique in Barbara Lidfors' work is oil paint built up in thin layers of contrasting colors on canvas. Her compositions are usually collaged together from a collection of photographs in which lighting, perspective, gestures and other factors play a defining role. The "frozen moments" of everyday experience are then elaborated upon and transformed into visual poetry by the deliberate and meditative process of painting. 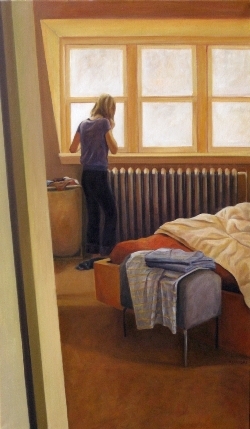 At the bedroom window, 2009, 65 x 100 cm, oil on canvas. Reaching, 2008, 50 x 150 cm, oil on canvas. 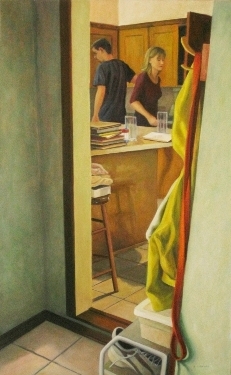 Two in the kitchen, 2010, 70 x 120 cm, oil on canvas. 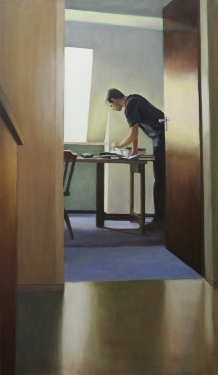 At the desk, 2008, 70 x 120 cm, oil on canvas. 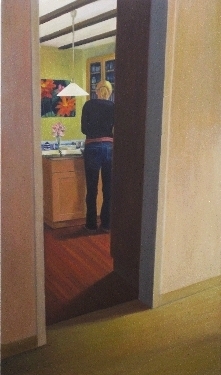 In the kitchen, 2009, 70 x 120 cm, oil on canvas.